Time has been dragging while waiting to visit Musks but somehow the whole day has flown by quickly. I left early to ensure I was at Musks by 9am. It was great to see Chris and catch up on what was new in the business and what had changed since my last visit in 2000/1. At 9.40am I called Radio Suffolk for my interview on the James Hazell show. James seems like a nice guy who knew a bit about sausages and we had a good chat. Just as I finished my interview the reporter and photographer from the Newmarket Journal arrived and we had a chat with them and then posed with the bike and some sausages. The sausages were cooked to perfection which was handy as it suddenly felt a long time since breakfast! We just about had time to catch our breath and then the lady from ITV arrived. Both Chris and I were surprised that it was one lady working on her own (no film crew etc) and she interviewed both Chris and I (eating sausages in my case) before doing some filming of the sausage making process. I always love seeing the skill with which the sausages are effortlesly linked. Fortunately I wasn’t asked to have a go for the camera! 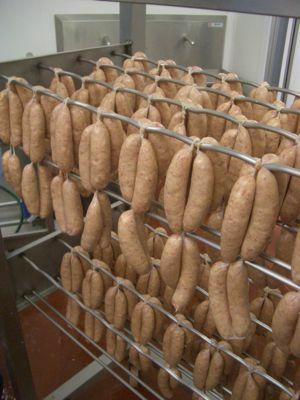 When linked the sausages are hung (as below) and dried for 20 minutes. I always feel this drying gives Musks sausages an edge over others (or it could be the top quality local ingredients)! 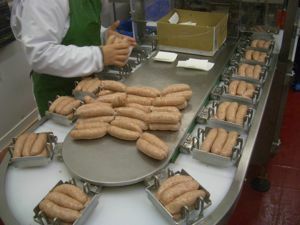 After being dried they are packed and go on their way to supermarkets and sausage lovers across the UK. As we were getting near the end of the sausage making process the man from the East Anglian arrived to take some pictures so it was off with the hairnet and back on with the bike jacket for some pictures on the bike (with sausages)! As if an excellent day couldn’t get any better I then got chance to pop over to Cambridge and do an interview on BBC Radio Cambridgeshire’s drive time. Both of the ladies interviewing me were interested in gluten free options so I was able to talk about the virtuals of the gluten free sausages from Musks which really do taste just like the real thing.